JUN ELDING grew up in Tokushima in eastern Japan. Her music carreer took off in 1991 by releasing her first album as the vocalist of the band PTON!, something that soon led to her writing songs for other artists and being a sought after backing vocalist. In 1998 the rock band Gitane was formed around Jun and the Honda brothers. 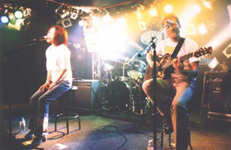 Takeshi Honda was already established as one of legendary Japanese guitarists, and the band soon gained fame as the GARBAGE of the Japanese scene, with enthusiastic fans not the least amongst other musicians. Still doing backing vocals for other artists at the time, Jun met Ulf Turesson, the co-producer of successful Japanese singer Tomoyo Harada, and other Swedish musicians, when she toured with Tomoyo Harada, a Japanese artist produced by Tore Johansson, producer of Cardigans. After touring Japan with Swedish artists Freewheel, Ray Wonder, Josie, and others, Jun went back with Ulf to Stockholm. During three months in the Ping Pong studio they recorded the second Little Viking album along with Hakan Bacchus, Fredrik Dahl, and Niclas Fransson. The Little Viking album STHLM was released on December 21, 2002. As a spin-off from Jun's album STHLM, the song MAGIC was reborn as FUTURE, the Ending Theme of the very successful animation KiddyGrade. The song was released as a single in November 21, 2002. In 2005 Jun married the Swedish architect Jonas Elding. The events leading up to this important step in her life affected Jun deeply. 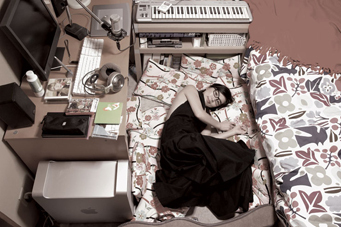 Shortly after the wedding, Jun reappeared under the new name JUN ELDING with a new solo album "Home", in September 6, 2005. Since 2007, Jun is living in Stockholm. Except as a singer & song writer, she is known as a essayist, radio host and Music TV host. Little Viking released two albums [We're in a small flight] and [STHLM], as well as the single [FUTURE]. The Recordings took place in Stockholm with Ulf Turesson and the members from his band [FREEWHEEL] . She also appeared as the host of the radio show [Chikyu Ongaku Kazoku] introducing Swedish music to a Japanese audience. Here she had sessions with Swedish Musicians, for example duetting with Bo Kaspers Orkester on [svart saga nej] Japanese version. Little Viking's MAGIC on her STHLM album, was reissued as FUTURE, the Ending Theme of the very successful animation KiddyGrade. The song was released as a single in November 21, 2002. KiddyGrade is well known among animation fans, both in Japan and worldwide. In 1998 the rock band Gitane was formed around Jun and the Honda brothers. Takeshi Honda was already established as one of the legendary guitarists of Japan, and the band soon gained fame as the GARBAGE of the Japanese scene, with enthusiastic fans not the least amongst other musicians. One of the critics said that Jun's lyrics in Japanese was like a Hemmingway. The band is now taking a long break. Songs released in the name of JUN MORIOKA are mostly from different projects. A lot of Japanese people know Jun as a singer of theme songs [LASSIE](Japanese Animation). At the album [Santa o shinjiru kodomotachi e], she was the first artist who recorded Japanese lyrics to [White Christmas]. These projects came from BANDAI, Gakken, Nippon Animation, Shinko Music. PTON! released their first album in 1991. PTON! was spotted by a record company director at the event [HOT WAVE], taking place in 1989 at the Yokohama Stadion, in front of an audience of 25,000. The management PTON! belonged to had several million-selling bands at the time. PTON! was expectied to carry on the tradition and was a heavily promoted teen-age pop band.